From May 5 to 15, Art Safari Bucharest will stage its third edition in downtown Bucharest, Romania. Art Safari will feature more than 50 leading galleries from Romania and Europe, displaying works by more than 800 artists of the 20th and 21st centuries. Organized under the patronage of the Ministry of Foreign Affairs of Romania, the third edition of Art Safari Bucharest will include a main exhibition focusing on the centenary celebration of Dada. Curated by Raya Zommer-Tal, Director of the Janco Dada Museum in Ein Hod, Israel, the exhibition explores the movement—uprooted from the beginning of the 20th century Romanian art scene—and its historical implications for the European and international art world. A complimentary conference program also dedicated to Dada will present panel discussions and lectures by internationally renowned professionals including Tom Sandqvist, Professor, University College of Arts, Crafts, and Design (Stockholm); Estelle Pietrzyk, Chief Curator of the Museum of Modern and Contemporary Art (Strasbourg, France); Marina Vanci Perahim, Professor Emeritus, Pantheon Sorbonne (Paris); Michael Finkenthal, Professor, Johns Hopkins University (Baltimore, United States); Horia-Roman Patapievici (Bucharest). Art Safari Bucharest, the only art fair in Romania, is an annual event focusing on the development of contemporary art. Romanian and international contemporary art galleries and museums are invited to showcase new directions in Romanian contemporary art and museum collections. 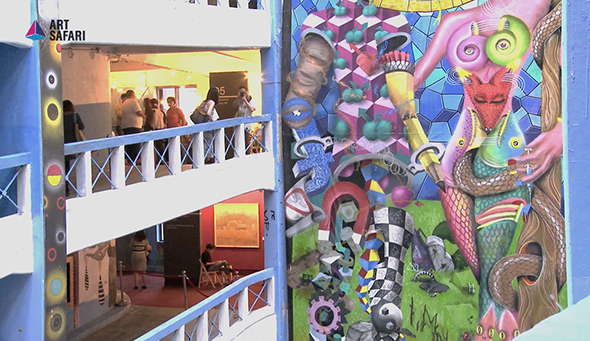 Following its second edition in May 2015 at the monumental Ciclop building, Art Safari was awarded First Prize in the Visual Arts category of the Bucharest City Prizes. Art Safari’s architect Attila Kim transformed the 4,800 sq. meter historical Ciclop building into Bucharest’s May Hotspot, where nearly 20,000 visitors were able to discover Romanian and international art exhibited by galleries and museums—many of the artworks previously unavailable to a larger international audience. The five-day program also offered the public a chance to be introduced to inter-media, performance, and video artworks (The Space, curated by Art Safari, presented visionary art produced by young artists in their 20s); to meet with important visual artists (Talk Non Stop—a series of artist talks); and to attend conferences or children’s and adult art workshops. Art Safari Bucharest 2016 is currently accepting applications for three sections: Contemporary, Modern, and Art Business. The application deadline for all sections is March 31.